Compatible Models: D14RY, S14Y, D13RY, S13Y. Condition: Tested working. Compatible Models: Twinhead Slimnote 5 or maybe other Slimnote models as long as it takes two ribbon cables shown in picture. The larger one has 16 pins, while the smaller one has 8 pins. PULLED FROM A TWINHEAD N222 LAPTOP BUT MAY FIT OTHER MODELS. PULLED FROM A TWINHEAD N222 LAPTOP BUT MAY FIT OTHER MODELS. ALMOST ANYTHING LLC. Compatible Models: Durabook D13RY (S13Y) & D14RY(S14Y). Condition: Used but in great condition. The screws holes are in good condition, no crack nor tear. Compatible Models: Durabook D14RM /U14M. Good condition. Minor scratch due to normal use. Compatible Models: Durabook D13RY (S13Y) & D14RY(S14Y). Condition: Used but in great condition. Screws will be included. Compatible Models: Durabook D14RL (S14L) / D13RL (S13L). Great condition. Ready to be installed. Screws are included. Compatible Models: Twinhead Durabook S14D, R14D, N14RI, S14K, R14K, N14RA, S14L, D14RL and the 13" LCD version of the above models. Compatible Models: Twinhead Gammatech S15C, S15S, D15TS. S15C Keyboard to Motherboard Connector MT-113S15C018 80 8A3633 00A w/ Ribbon Cable. Laptop parts. Fans / fan. • onproper function checked by German technicians. • tested forperfect function by a German technician. Pick up possible. Note: missing insert/print key. Note: missing insert/push button. Compatible Models: CD / DVD drive from Twinhead Durabook S14D, R14D, N14RI, S14K, R14K, N14RA, S14L, D14RL and the 13" LCD version of the above models. Compatible Models: Twinhead / Gammatech Durabook S15C. Maybe be compatible with D15TS (S15S). Connects motherboard to mic and another connector which might be a TSC connector and might stands for touchscreen but mine only has one mic connector, no touchscreen feature. New Gammatech Twinhead Durabook LCD Screen Right Side Hook Latch (see below for compatible models). Durabook Models: S14Y S14L S13Y S13L N14RI N14RA N15RI N15RB P14N. Compatible Models Earthwalk Models: Varies. (Compatible Models: N15RI N15RI2 R15D R15D2 P/N. Why buy the whole keyboard while all you need is one missing key for a small fraction of price?. Just snap the key in and avoid the hassle of taking apart your laptop :). Fans / fan. Laptop parts. • onproper function checked by German technicians. • tested forperfect function by a German technician. System cases / housings. Pick up possible. We try as soon as possible for a fair solution for you! Laptop parts. GRAPHICS CARDS. Fans / fan. Pick up possible. We try as soon as possible for a fair solution for you! We will try to find a quick and fair solution for you! Example image - similar to /Example Picture - Image similar. Laptop parts. Fans / fan. System cases / housings. Pick up possible. We will try to find a quick and fair solution for you! We try as soon as possible for a fair solution for you! After buying / After your Buy. Fans / fan. Laptop parts. Power supplies / power supplies. We do not have any influence or responsibility on your national laws! System cases / housings. Pick up possible. Minor differences in appearance do not affect, Which the function are possible. Type Clavier complet. RUSSIAN QWERTY KEYBOARD - New pour QWERTY RUSSIAN KEYBOARD - NEW For VERSION: Russian - Russian. The case is also a little dirty but not too horrible. The screen hinge has a plastic piece broken off but the screen itself does not appear to be broken but without turning it on I can not be sure of the either. Compatible Models: Twinhead (Durabook) P14N. There is a rubber cap underneath key cap and plastic hinge. 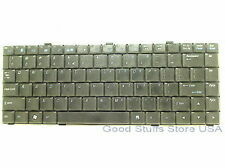 Why buy the whole keyboard while all you need is one missing key for a small fraction of price?.